Sakmar sees 'golden age' of liquefied natural gas (LNG) as a foundation fuel for the future. April 10, 2013 – A University of Houston Law Center expert on liquefied natural gas as the energy source of the future will speak at four sessions of LNG 17, the largest global gas conference of the year to be held in Houston April 16-19. "LNG is the fastest growing segment of the energy market and its role as the 'glue' linking global gas markets is set to intensify as more and more countries look to LNG to meet growing energy demand with cleaner burning fuels," said Susan L. Sakmar, a visiting assistant professor and Andrews Kurth Energy Law Scholar. 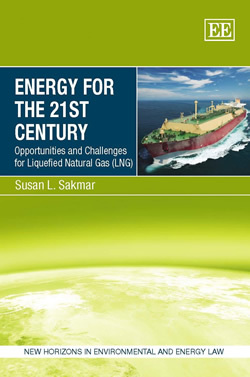 Professor Sakmar will publish her first book, Energy for the 21st Century: Opportunities and Challenges for Liquefied Natural Gas, in May. With policymakers around the world increasingly looking to natural gas and LNG to meet the twin challenges of energy security and climate change, her timely book provides critical insights into the opportunities and challenges LNG faces. Sakmar addresses all facets of the LNG business, including the LNG value chain, the evolution from regional trade to a more globalized LNG market, LNG pricing, contracts and trade, and emerging issues such as the impact of shale gas on global gas markets and the prospects for U.S. and Canadian LNG exports. Her analysis concludes this century will be the "golden age" of natural gas with LNG serving a critical role in moving gas to market. "The LNG market over the past five years has evolved into one which is increasingly interconnected as LNG becomes a more globalized, if not quite yet commoditized, product," Sakmar said. "With a range of critical emerging issues, from shale gas to U.S. LNG exports, it is becoming increasingly essential for everyone to expand their knowledge about the growing role natural gas and LNG will play in the energy supply mix of the future. "My book is intended to provide a broad overview of the dynamic LNG industry and hopefully it will serve as a useful reference for anyone interested in 21st century energy solutions." The 17th International Conference and Exhibition on LNG will take place April 16-19 at the George R. Brown Convention Center and is expected to draw more than 5,000 industry professionals from more than 80 countries. Held under the auspices of the International Gas Union (IGU), LNG 17 will be hosted by the American Gas Association (AGA) with numerous sponsors, including the University of Houston. Media Contacts: Carrie Criado, UH Law Center Executive Director of Communications and Marketing, 713-743-2184, cacriado@central.uh.edu; or John T. Kling, UH Law Center Communications Manager, 713- 743-8298, jtkling@central.uh.edu. The University of Houston is a Carnegie-designated Tier One public research university recognized by The Princeton Review as one of the nation's best colleges for undergraduate education. UH serves the globally competitive Houston and Gulf Coast Region by providing world-class faculty, experiential learning and strategic industry partnerships. Located in the nation's fourth-largest city, UH serves more than 40,700 students in the most ethnically and culturally diverse region in the country.